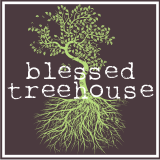 Blessed Treehouse: What can I say? My 8-month old baby girl is too darn cute. Gosh, she makes me happy. why is she so flippin cute and sweet? Yes...I agree pretty darn cute! Thanks for sharing her today!! Hope she enjoyed eating the crumbs off my kitchen floor! Marla - It was better than her usual diet of dog hair and almonds.